The site of the east landing for the new 520 Bridge and maintenance facility is immediately adjacent to the existing bridge. The cramped and closely interconnected nature of the site provided a constant challenge to maintain access from the top of the bluff down to the Lake Washington shoreline. Construction underway on Pier 2. Pier 2 is located along the shoreline of Lake Washington and is founded below the groundwater table. 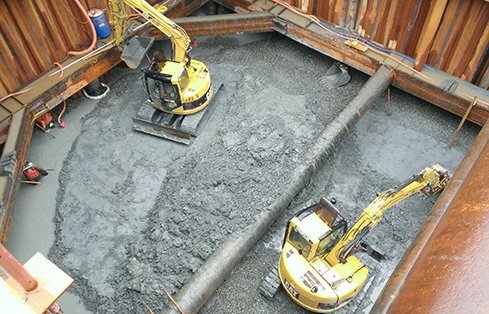 The design called for sheet piles and deep dewatering wells to construct and dewater the temporary cofferdam during excavation and construction of Pier 2. 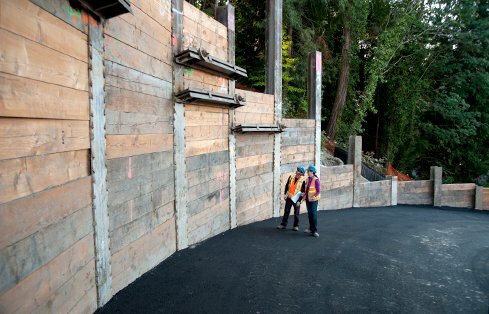 The site's location at the base of a steep slope required the team to use a number of soldier pile retaining walls to maintain access to the shoreline during construction and create space to construct the maintenance facility and bridge foundations. 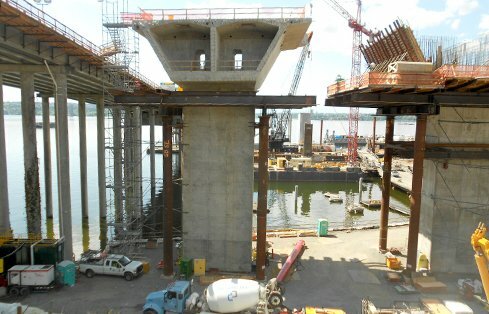 Support piers for the new 520 Bridge rise out of the eastern landing site next to the existing 520 bridge. The new bridge will be significantly wider, supporting six lanes of traffic plus a bicycle/pedestrian lane. Our field engineer, Hamilton, taking inclinometer readings at the top of a 60-foot-tall shoring wall in full fall protection. GeoEngineers monitored movement of the wall face to ensure that the wall was meeting performance criteria. The team designed a cofferdam and dewatered it prior to excavation for Pier 1. Excess pore water pressures in the underlying foundation soils were monitored continuously to prevent unstable conditions from developing as the water level was lowered. 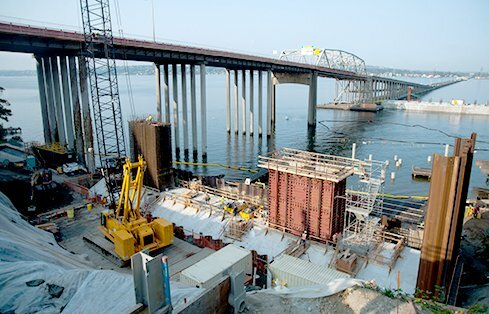 Comprehensive geotechnical design for the east approach and landings of the longest floating bridge in the world. 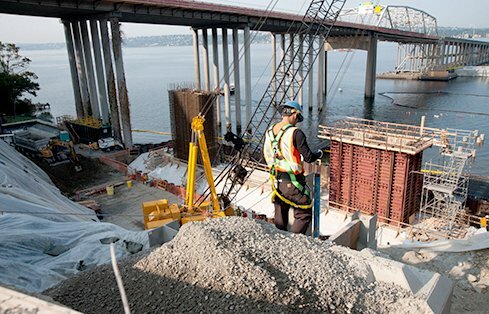 The Washington State Department of Transportation (WSDOT) needed to make critical improvements to the SR 520 Floating Bridge across Lake Washington, a major four-lane artery connecting Seattle to Bellevue and suburbs to the east. Evaluations showed the bridge, in service since 1963, to be in poor condition, and a significant seismic risk in the event of an earthquake. WSDOT began plans for a replacement bridge and started construction in 2012. The existing and new bridges are both designed around floating pontoons moored by anchors in the lake bed. The new structure is wider and longer than the bridge it replaced—its 7,710-foot span makes it the longest floating bridge in the world. Improvements include an additional HOV lane in each direction (six total lanes of traffic), a wider shoulder, a bicycle/pedestrian lane, and expansion capacity for future light rail. GeoEngineers worked with the Kiewit-General-Manson (KGM) Joint Venture design-build team and provided geotechnical consulting, design and construction support for the eastern bridge landing near Evergreen Point Road and for the casting of gravity anchors used to stabilize critical portions of the bridge’s floating expanse. In addition to the three piers supporting the landing, GeoEngineers also worked on a new WSDOT maintenance facility and dock located beneath the bridge. After thoroughly evaluating subsurface conditions and conducting 3D numerical modeling to evaluate foundation performance under various load cases, the GeoEngineers team recommended using shallow foundations to support the east approach piers rather than the drilled shafts shown in the conceptual designs. Numerical modeling showed that shallow footings founded on native, undisturbed glacially consolidated soils would meet safety and performance objectives, and detailed dewatering evaluations concluded the revised design was indeed constructible. This recommended change to the design and construction plan saved the state approximately $20 million, while maintaining strict structural and safety standards. GeoEngineers designed cofferdams and dewatering plans to provide access to the lakebed while building piers 2 and 3. The team also performed groundwater investigation, testing and analysis to develop temporary and permanent dewatering plans for the maintenance building and retaining walls. Artesian aquifers increased the need for effective methods for controlling groundwater during and after construction. The steep hillside and the tight, interconnected nature of the east landing site was a frequent challenge to the GeoEngineers team. Making adjustments to a single design element invariably affected other components, and meant a constantly evolving series of updates to construction plans. GeoEngineers evaluated WSDOT’s plan to support the east landing piers with drilled shaft foundations, and recommended changing the construction plan to use 170-foot-long, 40-foot-wide, and 6- to 12-foot-thick shallow spread footings instead. The team used a combination of field explorations and sophisticated 3D numerical modeling to evaluate the proposed shallow footings and determine their performance under a variety of load conditions. By proposing and substantiating this alternative, GeoEngineers simplified construction, reduced environmental impact and saved the client money. Two of the three large piers supporting the bridge landing required constructing and designing cofferdams to dewater the excavation sites, a process complicated by artesian groundwater pressure. GeoEngineers developed a vibration-monitoring plan including a pre-construction survey of existing structures, monitoring during construction and pre-planned mitigation measures in the event that construction exceeded vibration thresholds. To support various phases of construction, the team designed more than 17 temporary and permanent soldier pile and tie-back retaining walls. In addition to the bridge piers, GeoEngineers’ team provided geotechnical design and groundwater control recommendations for a WSDOT maintenance facility and dock located underneath the bridge’s east landing. Various components of the site required compliance with American Association of State Highway and Transportation Officials (AASHTO) standards, the International Building Codes (IBC), and the WSDOT Geotechnical Design Manual. The team carefully monitored compliance under each set of standards during design and construction. 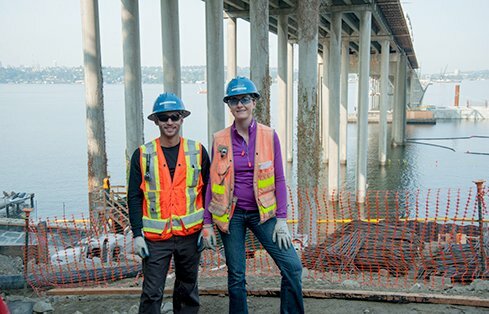 GeoEngineers completed geotechnical investigation and designs, dewatering plans, and provided monitoring and consultation during construction to help the Kiewit-General-Manson team complete the east landing of the SR 520 Bridge to help meet all of the client’s requirements. The GeoEngineers team delivered added value by recommending cost-saving shallow footings and managing its portion of this high-profile and complex project efficiently and safely. The completed bridge significantly improved transportation to and from Seattle across Lake Washington and improved public safety according to current WSDOT design standards. Design-Build Institute of America 2016 Design-Build Project/Team Award of Merit.